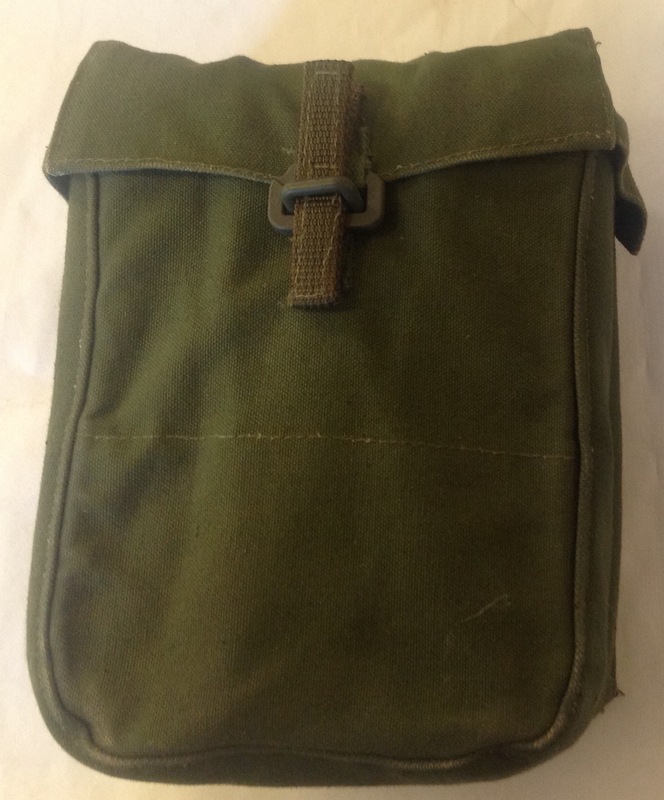 Tonight after several months we come to our final piece of 64 pattern Canadian Webbing; the canteen carrier: Like the earlier 51 pattern carrier, this is based off contemporary US design, with a carrier made of the same plasticised canvas as the rest of the set. 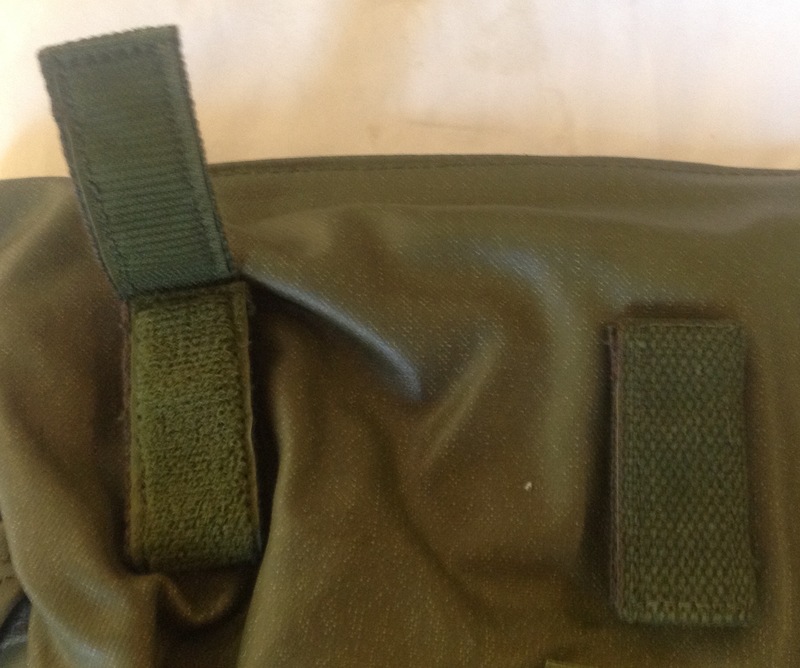 The rear of the carrier has a large velcroed channel for wrapping around the belt: Due to the weight of a full canteen, this fastener was particularly useless for this component! 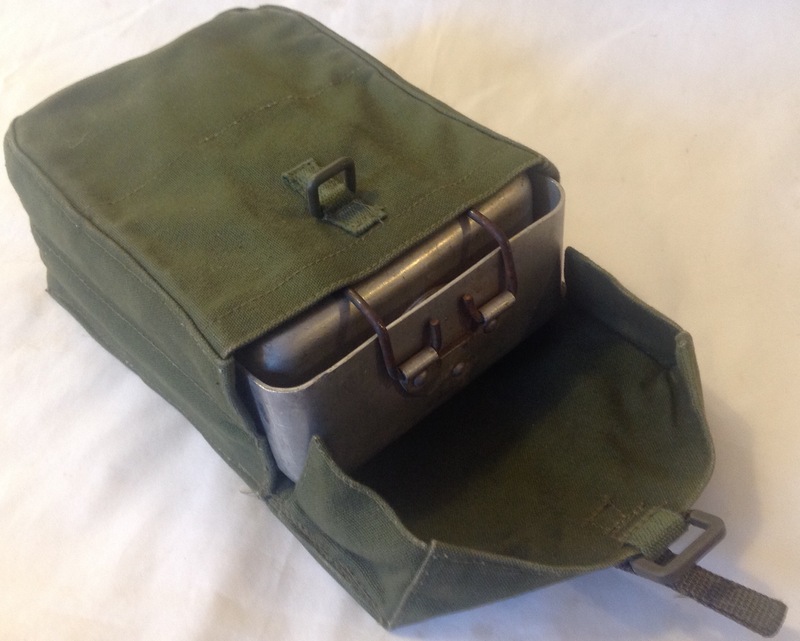 The canteen fits snuggly into the carrier, but is still easy to withdraw: Both the older metal and the new plastic canteens were issued with the carrier as stocks allowed. 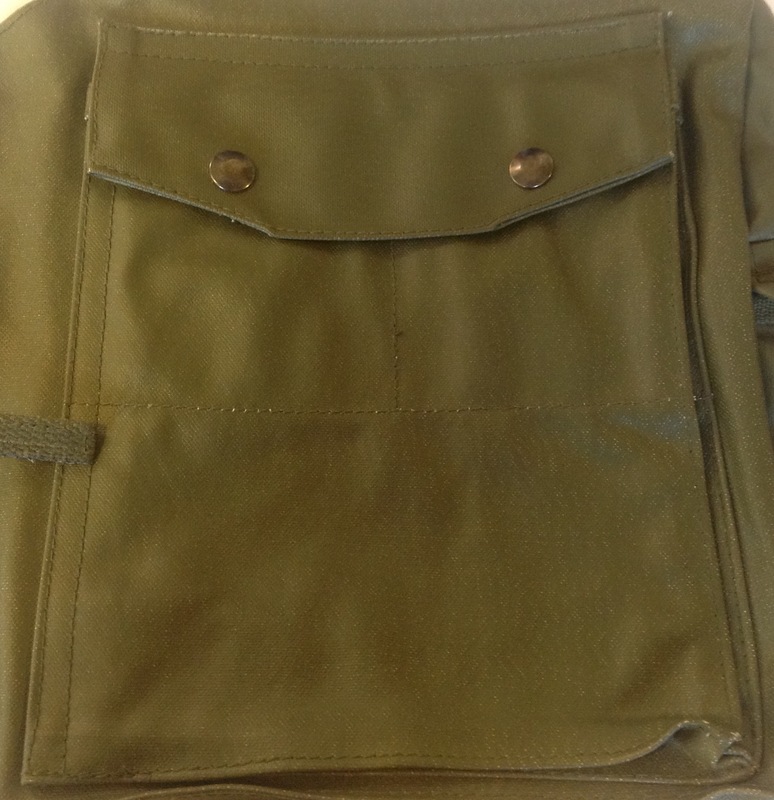 The inside of the carrier has a felted wool liner: This acts as insulation and stops the water from freezing as easily in Canada’s cold winters and can be wetted to keep the canteen cool in summer- as the water in the felt evaporates it draws in heat from the canteen and helps prevent it from warming up. This entry was posted in 64-Webbing, Canada, Post WW2, Webbing on June 6, 2017 by hatchfive. 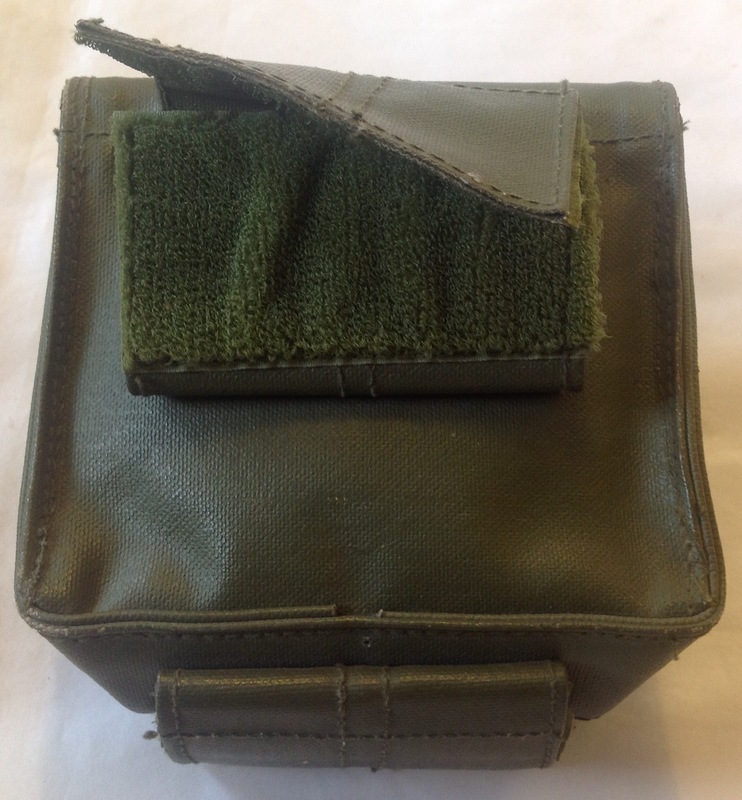 We are nearing the end of our review of the Canadian 64 pattern webbing set, but there are still a couple of nice pieces to go and tonight we are looking at the respirator case: Canada had adopted an updated respirator in the 1950s known as the C2, and this was further improved in the early 1960s to become the C3. 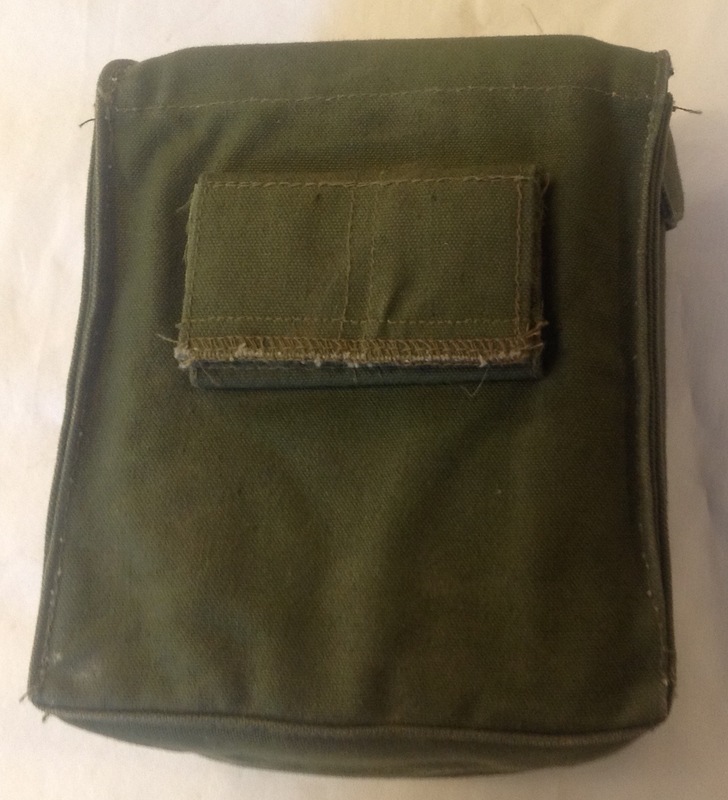 These respirators were stored in a specialist pouch that was slung on the left hip as part of the actual webbing set, with cotton webbing versions issued with the 51 pattern, and an updated plasticised cotton version being introduced as part of the 64 pattern set. 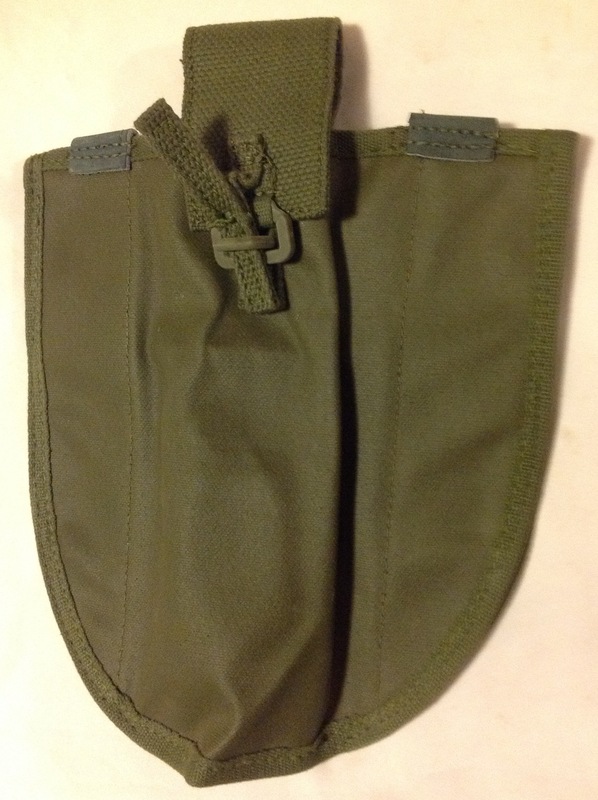 The respirator case is a large bag, with a side opening to allow the mask to be placed inside. 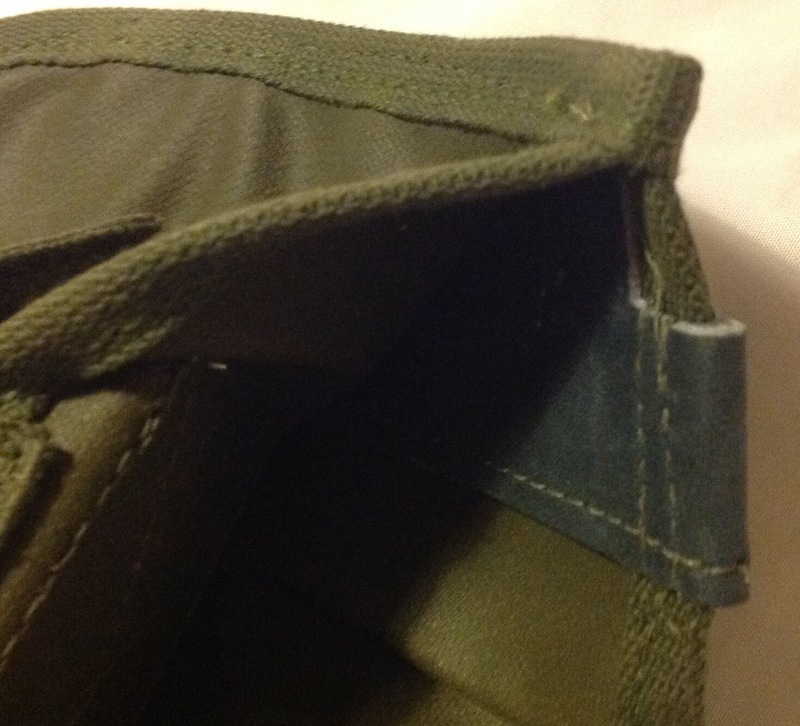 The opening is sealed by rolling it up and attaching a piece of Velcro as a fastener: The webbing tab allows the user to easily open it, even when wearing NBC gloves. 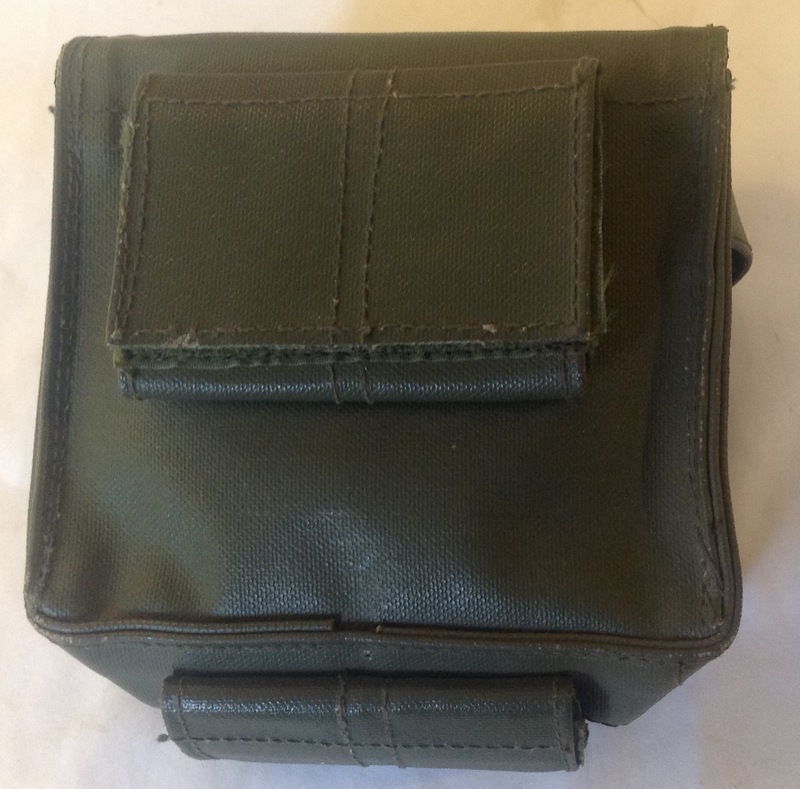 A large pocket is provided on the front of the haversack for gloves, spare canisters, decontamination equipment etc: This is secured with two metal press studs. 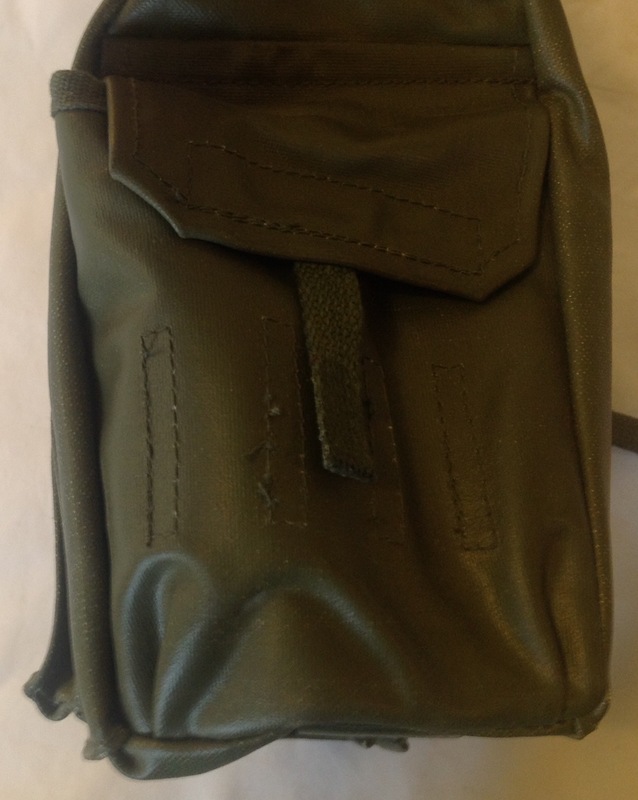 A second pocket is fitted to the opposite edge to the haversack’s main opening: This is far smaller and has internal dividers to allow it to carry anti-nerve agent epipens, again a cotton tab is provided for easy access when wearing gloves. 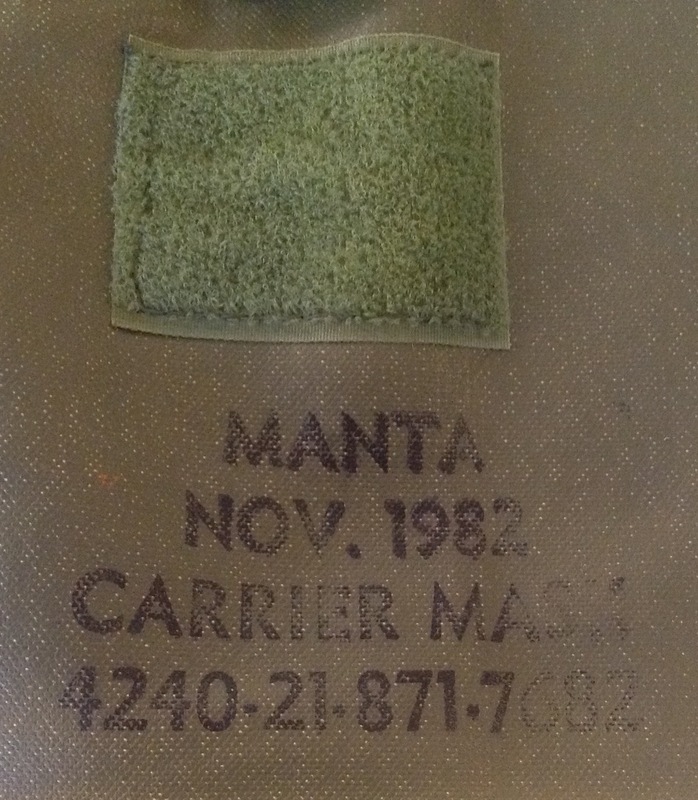 As with the rest of the items of the 64 pattern webbing set, the method of attachment to fasten the haversack to the belt is woefully inadequate, here consisting of two Velcroed loops: Markings consist of a single stamping on the bag that indicate the haversack dates from November 1982 and was made by ‘Manta’: The use of plasticised cotton was actually far more appropriate for this component than the earlier cotton version, being much easier to decontaminate on a potential Cold War nuclear battlefield. This entry was posted in 64-Webbing, Canada, NBC, Post WW2, Webbing on May 9, 2017 by hatchfive. 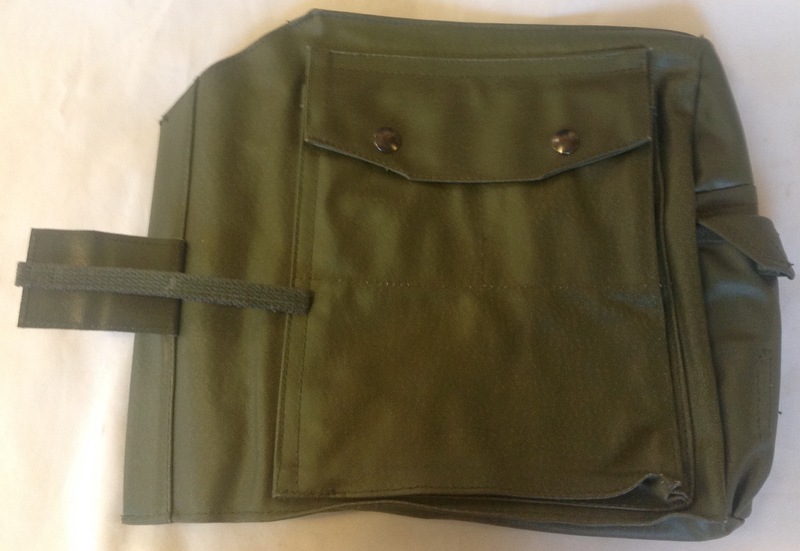 I noted the incredibly poor quality of the 64 pattern belt when we looked at this a few weeks back. 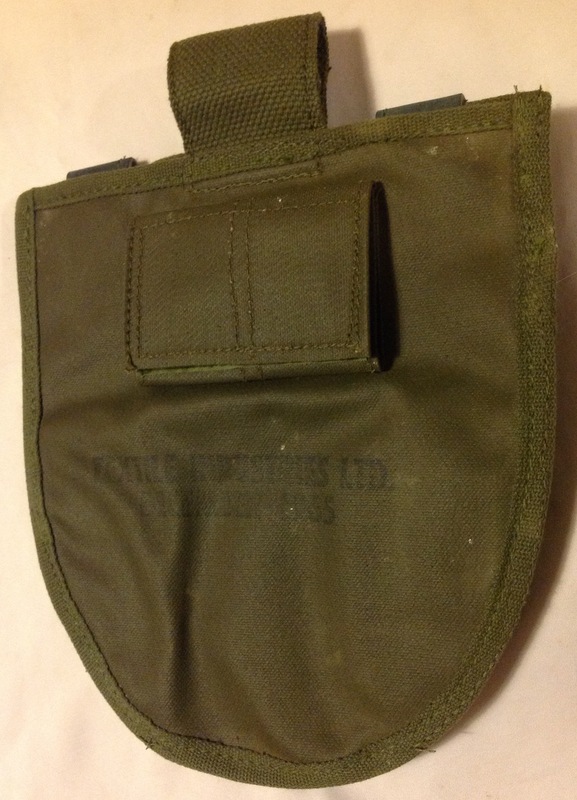 Tonight we are considering the suspenders from the same set and again the design is particularly poor. 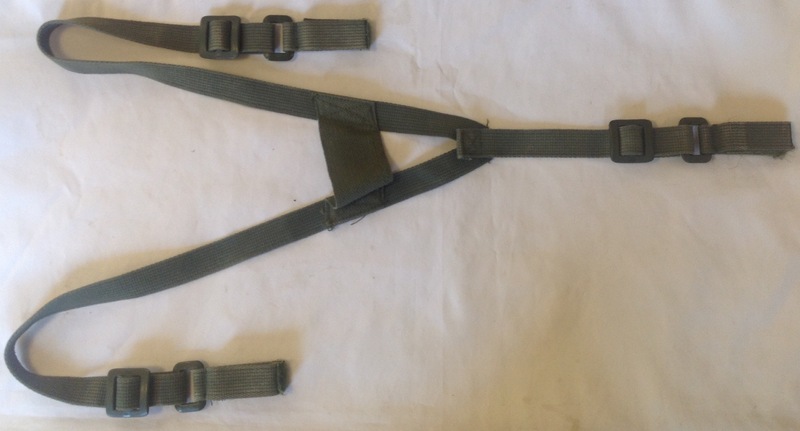 Suspenders on a webbing set are designed to transmit the load from the belt and rucksack to the wearer’s shoulders. As such it is normally best for them to be as wide as possible where they meet the body to help transmit the load, prevent them from digging in and to keep chafing to a minimum. 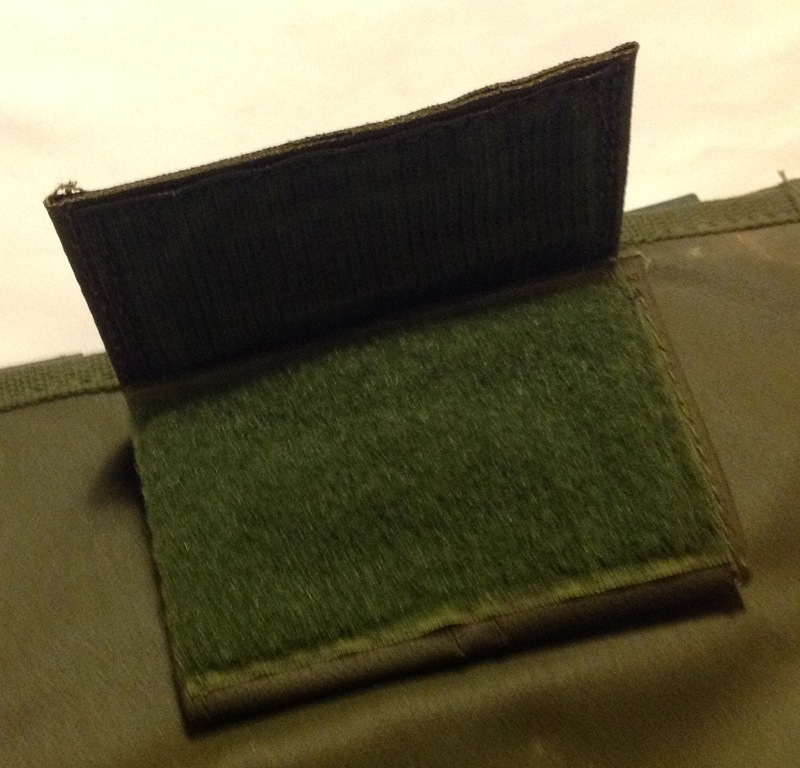 If not padded it is still usual to try and have at least a 2” wide surface here. 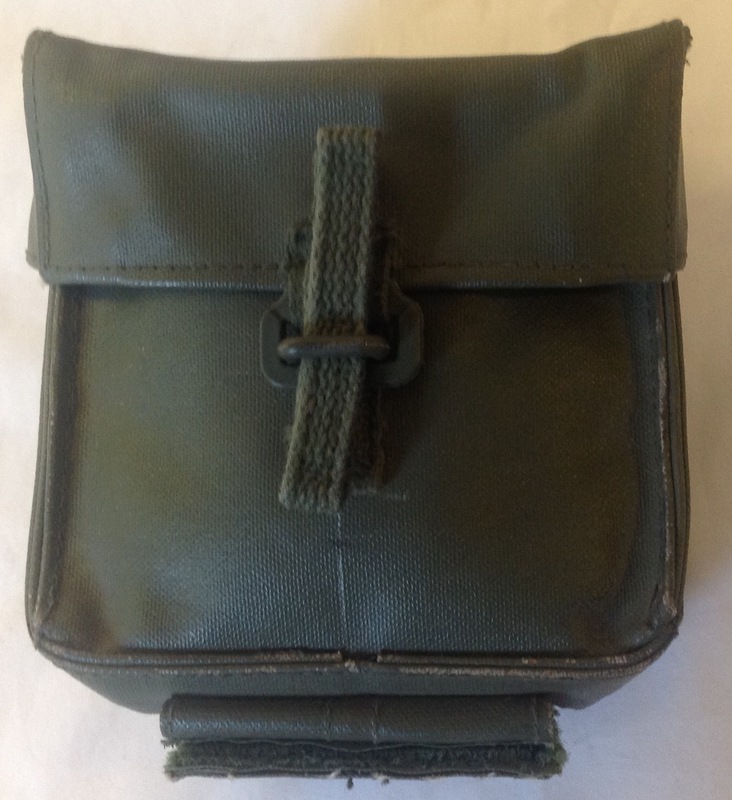 The Canadian 64 pattern set however is made entirely from 1” wide cotton webbing, in a ‘Y’ shaped yoke: This is worn with the single attachment point at the rear and the two straps passing over the shoulders to re-join the belt at wither side of the buckle. 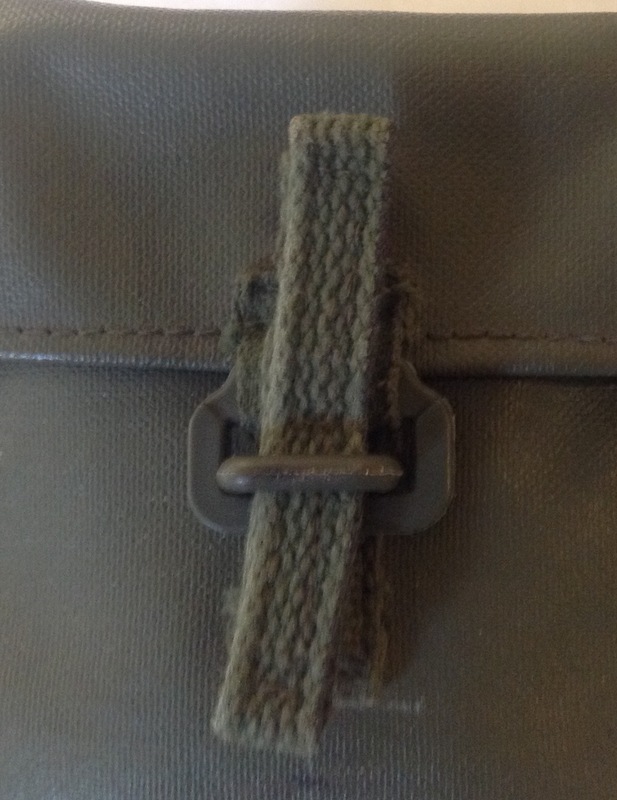 These straps are fitted with a plastic loop and buckle at each end: The buckles allow the wearer to adjust the yoke to size, but it is only held to the belt by a loop of Velcro: Finally a small piece of webbing joins the two front straps of the yoke, this would sit high on the shoulder blades in use and helps keep the straps all at the right angle: The yoke is a weak point in an already poor quality webbing system. 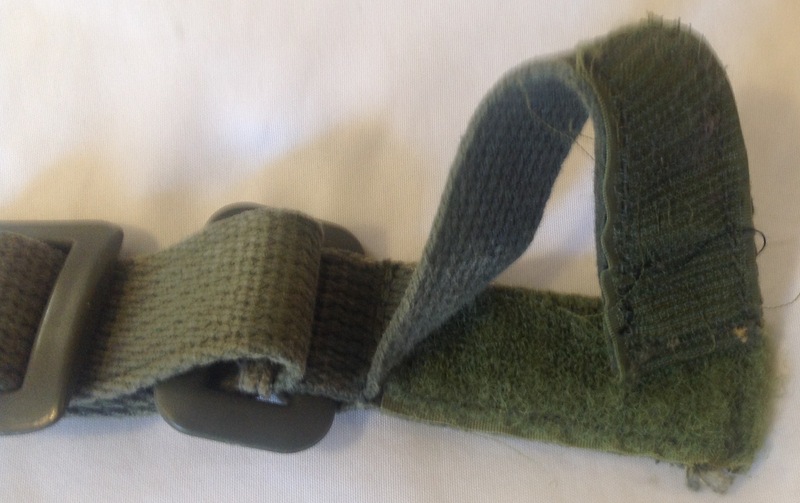 The straps dig into the wearer’s shoulders, it is not particularly stable when worn and the Velcro is prone to wearing resulting in the whole set falling apart if you are not careful. 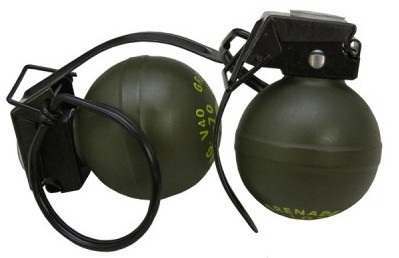 It is easy to see why it was universally loathed by those unfortunate enough to be issued with it! This entry was posted in 64-Webbing, Canada, Post WW2, Webbing on April 11, 2017 by hatchfive. 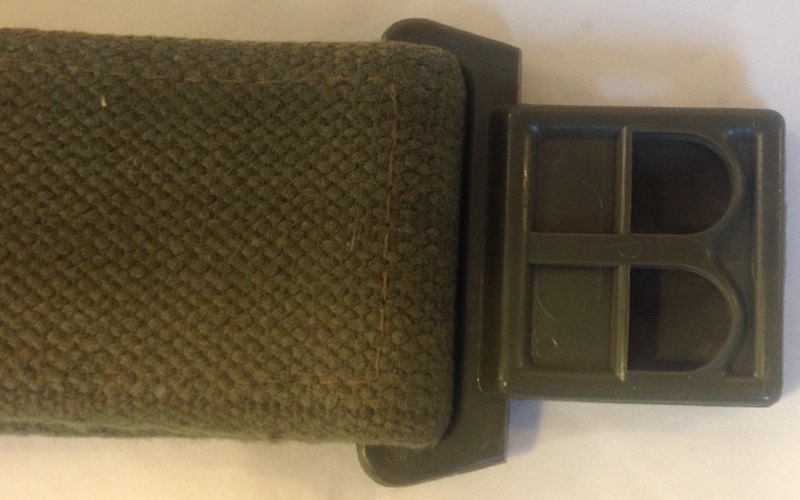 This week’s piece of Canadian post war webbing is the 64 pattern belt. 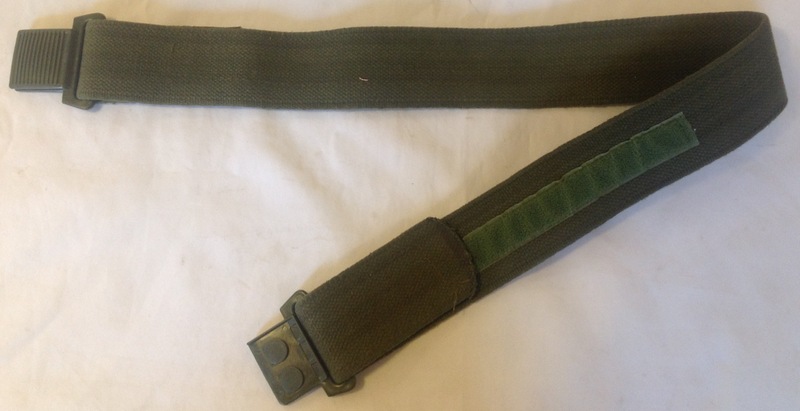 As mentioned several times before, the 64 pattern webbing set is pretty atrocious, and the belt is no exception. 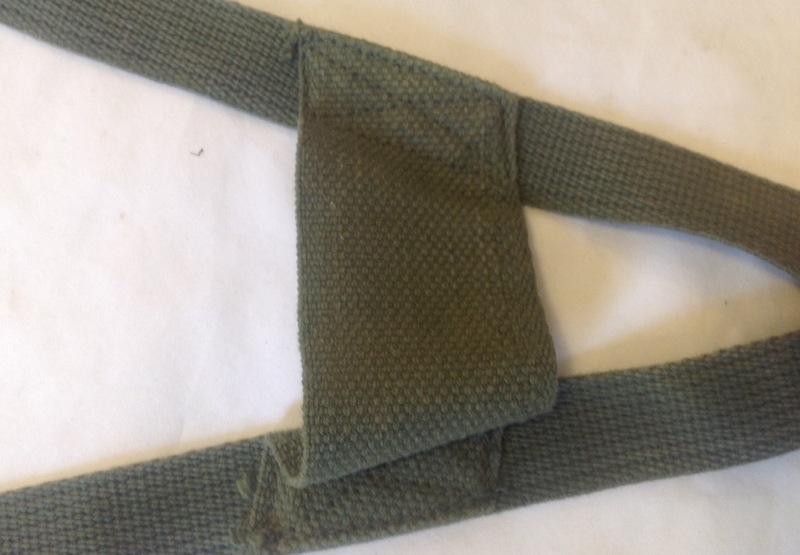 It is about as simple as a belt can get and is made of a simple piece of green cotton webbing: The rear of the belt has a strip of Velcro sewn to one end and this is how the belt is adjusted. 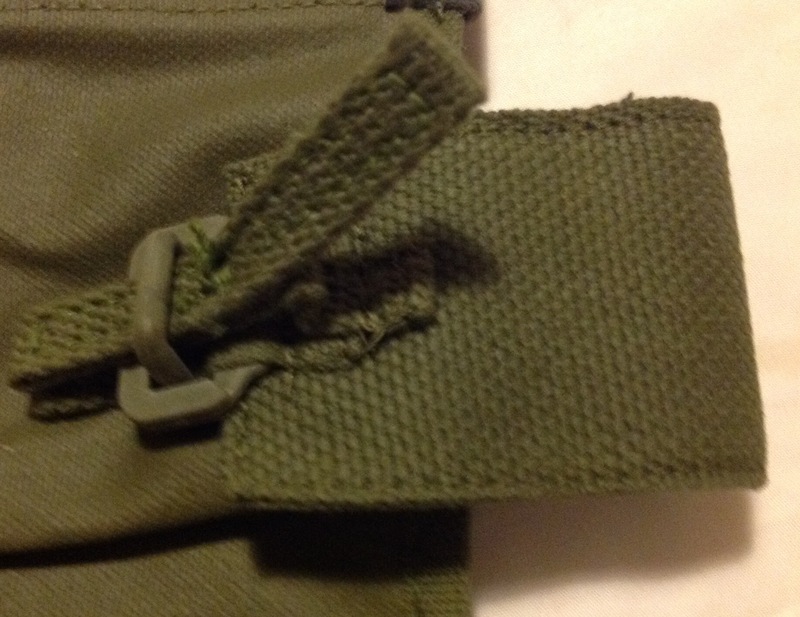 The hook piece of Velcro is sewn to the end of the webbing, passes through the buckle and is looped back to stick to the loop piece: The buckle itself is made from heavy duty green plastic, with male and female halves: These fit one over the other, with the two shallow prongs falling down into the two holes of the corresponding belt part: It might just be me, but I found this belt nearly impossible to undo without resorting to something to pry the two halves of the belt back apart! 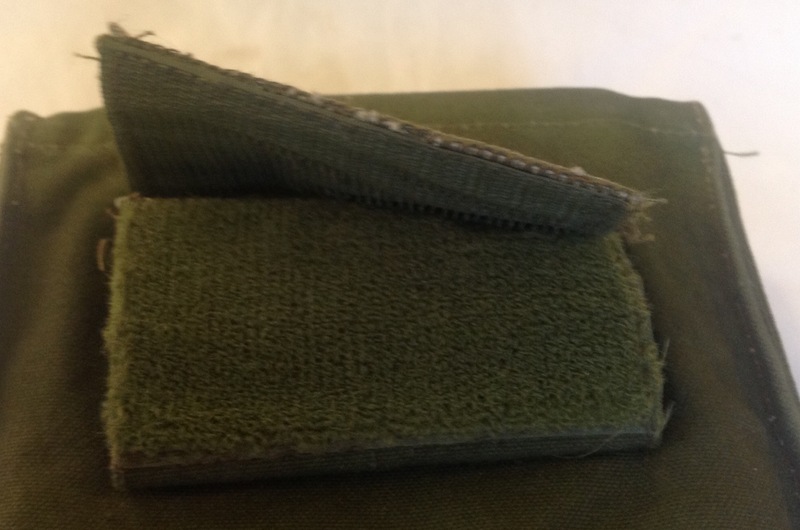 The belts were not very successful as the Velcro weakened over time and came undone. 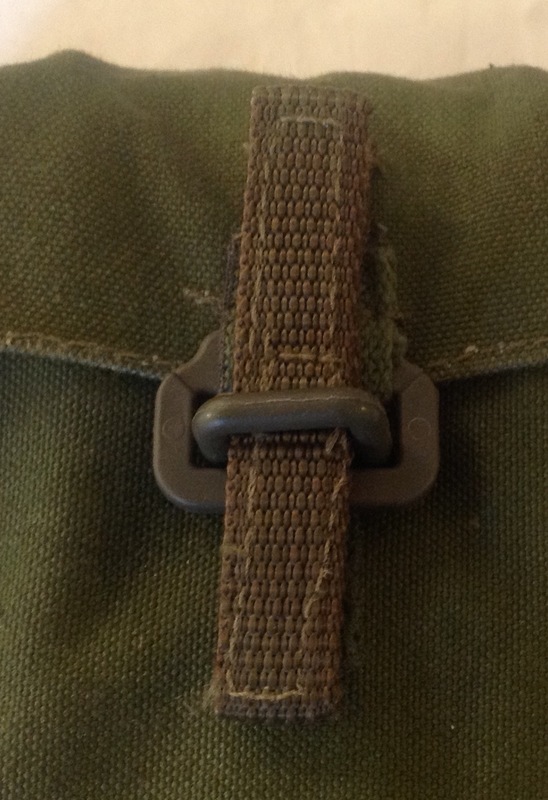 It was common to see the ends of the belt secured with gun-tape or a spare brass keeper off the old 51 pattern set. This entry was posted in 64-Webbing, Canada, Post WW2, Webbing on March 28, 2017 by hatchfive. This entry was posted in 64-Webbing, Canada, Post WW2, Webbing on March 7, 2017 by hatchfive. 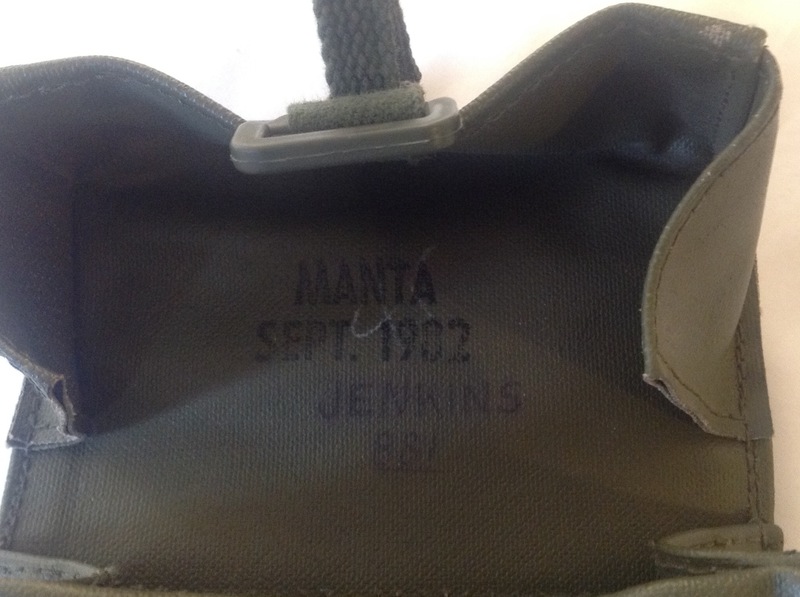 However it was too small fopr this and they were an incredibly tight fit. 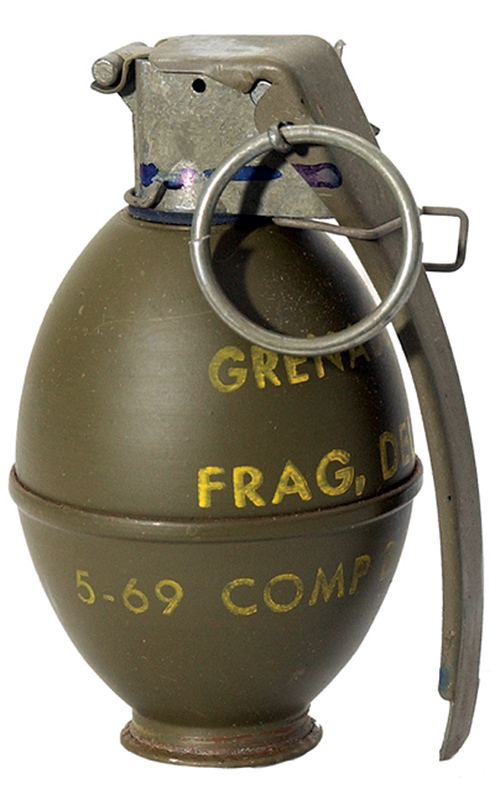 It was far better holding V40 ‘mini frag’ grenades, five fitting into the pouch: The pouch was also frequently used to carry a cleaning kit for the wearer’s weapon rather than for its intended purpose. This entry was posted in 64-Webbing, Canada, Post WW2, Webbing on February 21, 2017 by hatchfive.